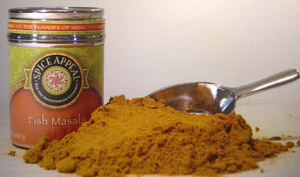 A flavorful mixture of Indian spices specially prepared for fried fish and seafood curries. Sprinkle over fish and let sit for a half hour to marinate. Then fry well, and enjoy this flavorful and exotic version of fried fish. Use to season fish curry, or add to fish and seafood when fried with onions, garlic, and ginger. Spice mixture includes coriander, black pepper, mustard, fennel, turmeric, cloves, black cardamom, and other spices.